Google recently released a new app called “Inbox”, which is essentially a new interface for Gmail. I’ve used Gmail since its very early days, and I really like how it’s grown and matured. So I was a little skeptical when I read the Google explanation of what Google Inbox was supposed to be. Right now it’s in beta, so you have to get an invite to try it out. To get an invite, either ask a friend who is already using it (Google gives new users three invites to share), or go sign up for it here. Of course, the marketing made it sound like it was something that would be life altering. My first impression was was less than enthusiastic. The interface seemed like a very stripped down version of their Gmail app. And it introduced a few things that seemed a bit odd. First, it wanted to “Bundle” most items. Long time Gmail users may recall when Google instituted their “tabs” interface- which would pre-arrange items in certain logical categories for the user automatically. I didn’t find that helpful, so I turned it off. Well, whoever thought that the tabs were a good idea at Google must’ve been on the Inbox team, because it popped back up, only this time called “bundling”. So if you received several emails from websites about sales, etc., it would pre-arrange them in one group, while items about banking might be in another. The idea is that if you receive a lot of emails, it attempts to bring some sanity to your inbox. The other major thing Inbox introduced was the idea of classifying incoming mail as either “Done” or “Snooze”. The “Done” feature basically works like Gmail’s “Archive” feature. it doesn’t delete an email, just moves it out of the inbox. So I thought the renaming was a bit odd…. why not just call it “Archive”. The feature I did like was “snooze”. it works like this- say you get an email from a friend that you wan to reply to, but you won’t have time until later, and you don’t like items cluttering your inbox. So you hit the snooze icon, and Inbox asks you when to bring it back- tomorrow, in a week, even “someday”. And it gives you the ability to set a custom time. I really liked that feature. Another nifty item Inbox has is the ability to set a “reminder”. It’s basically sending a scheduled email to yourself. So instead of sending yourself an email that says “call the bank”, and hoping you see it the next day and remember it’s there in your inbox, the reminder actually lets you schedule it. So the next day, 10 minutes before your lunch time (or whenever you set it), the message pops into your inbox. So I decided to give it a few weeks of use, and really see how I liked it. The first thing I did was head to Google to find out how to turn off that “bundling” garbage. Some may find it useful, but I didn’t. Once I slayed that dragon, I started to warm up to the app. In regular use, it works much like Gmail- just stripped down to the basic components. I found the “Done” and “Snooze” features very handy. The Reminder feature is also nice. After two weeks, I found that I was using Inbox exclusively over Gmail. Going back to the Gmail app seemed a bit crowded in comparison. And then today (11/11/2014), Gmail’s app was updated. And it sure looked familiar. Pretty much like Inbox, only without the Inbox features. Personally, I like this just fine. I’ve always thought Google does an awesome job with user interface design. And it was assumed from the beginning by most tech bloggers that Inbox represented the future of Gmail. Who knew it was such a short time table though? 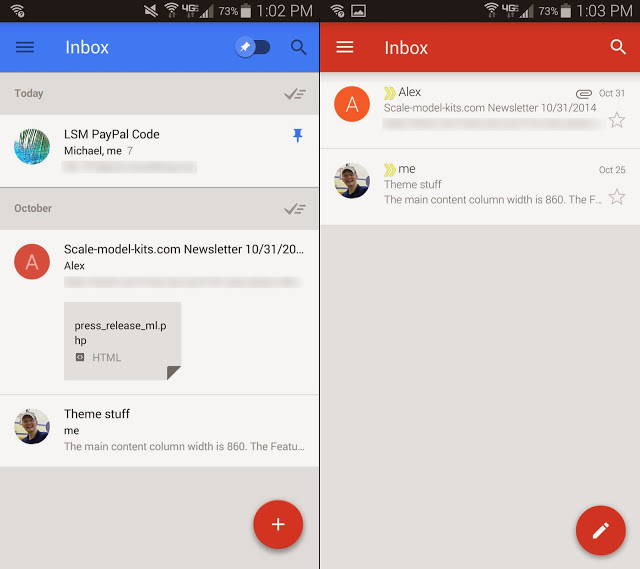 Here are some screenshots of Inbox and Gmail’s new look. First, the main screen. Inbox on the left, Gmail on the right. Notice how they display things a bit differently. Inbox (left) shows a “pinned” item, and also shows a thumbnail preview of attachments. Photos show up as photos- making it easy to scroll through your mail to find a particular photo. Both use slightly different formats to show when a message was received. Both Inbox and Gmail have a similar interface to compose messages. Inbox is on the left, Gmail on the right. Why the switch of the “from” and “to” I don’t know. Inbox tries to be a little “hipper” with “say something” instead of “compose email”. Adding attachments is handled the same way- click the icon, add the attachment. Any message you start composing is saved in the Drafts folder automatically, in case you have to come back to it later. Both interfaces make use of the same method to access additional functions, such as “folders” (labels) that you may have already created in Gmail, and also Inbox’s bundles. Just tap the three horizontal bars in the upper left. Of course, it’s all tied in to your G+ account, as can be seen by the small photo icon & background. The genius of this method is that once Inbox is thoroughly “Beta” tested, Google will be able to announce a rollout of a “new” product, and it will basically add features for anyone not using Inbox without drastically altering the interface. That is usually the single biggest factor (in my experience) in resistance to an upgrade- user interface changes. By quietly rolling out a Gmail look that is similar to Inbox, users will be trained for Inbox without realizing it. Google will have the option of simply rolling in inbox features to Gmail a few at a time, or en masse, or they can have a “new” product to “replace” Gmail, without it being so unfamiliar that users hate it. They still have some work to do on Inbox…. moving a message to “Trash” should be as easy as “Done” and “Snooze” are. (Right now you have to tap a menu, then select Trash.) And the logic behind “labels” in Gmail and “bundles” in Inbox still seems to need to some in order to make the transition smooth. Another BIG question in my mind is how will the PC version of Gmail and Inbox shake hands. Gmail on your PC can do some heavy duty lifting. Inbox on the PC is a bit anemic, really. It’s just like the inbox app- which is fine for a phone, but maybe not so much if you’re a “power user” on a PC trying to do a bit more with organizing and filtering your mail. But overall, I’ve warmed up to Inbox. I use it exclusively on my phone and tablet. If you’re a Gmail user who spends a fair amount of time on your phone or tablet handling mail, I’d recommend giving it a try. After the latest Gmail app update, it won’t be too drastic of a switch!